This is the third edition of the pioneering work that has become the standard text in the field. The first edition was one of the earliest to establish that the newly developing international law of human rights could be set down as any other branch of international law. It also incorporates the complementary fields of international humanitarian law and international criminal law, while addressing the problems associated with their interaction with human rights law. The book is more than a descriptive analysis of the field. It acknowledges areas of unclarity or where developments may be embryonic. Solutions are offered. Recent developments have confirmed the value of solutions proposed in the previous editions. Central to most of the chapters is the prohibition of torture and cruel, inhuman, or degrading treatment or punishment. The early chapters focus on the period of first detention, when detainees are most at risk of having information or confessions, however unreliable, extracted by unlawful means. Voices contemplating the legitimacy of such treatment to combat terrorism have been heard in the wake of the atrocities of 11 September 2001. The book finds that the evidence clearly suggests that theabsolute prohibition of such treatment remains firm. Other chapters deal with problems of poor prison conditions and of certain extraordinary penalties, notably corporal and capital punishment. A chapter explores ethical codes for members of professions capable of inflicting or preventing the prohibited behaviour (police and medical and legal professionals). 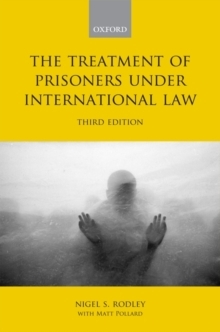 Chapters are also devoted to the extreme practice of enforced disappearance and the contribution of the new convention on this phenomenon, as well as to extra-legal executions.